The Conners premiered its first episode on Tuesday night, finally putting to rest any speculation about how the Roseanne spinoff deals with the absence of Roseanne Barr's titular character. 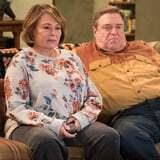 Barr's initial reboot of the show was of course axed by ABC after a string of vile, racist tweets and abrasive behavior from the 65-year-old, and she revealed during an interview a few weeks before the The Conners premiere that the show planned on killing off Roseanne Conner via opioid overdose. Now that we know that is indeed how the character dies - she overdoses on medication prescribed to her following knee surgery - Barr is speaking out about how disappointed she is with the twist in a joint statement with her Rabbi, Shmuley Boteach. "While we wish the very best for the cast and production crew of The Conners, all of whom are deeply dedicated to their craft and were Roseanne's cherished colleagues, we regret that ABC chose to cancel Roseanne by killing off the Roseanne Conner character," the statement reads. "That it was done through an opioid overdose lent an unnecessary grim and morbid dimension to an otherwise happy family show. This was a choice the network did not have to make. Roseanne was the only show on television that directly addressed the deep divisions threatening the very fabric of our society. Specifically, the show promoted the message that love and respect for one another's personhood should transcend differences in background and ideological discord." Dan Conner mourning the loss of his wife. While Roseanne Conner might have been liberal-leaning and embraced her LGBTQ+ friends in the original run of the sitcom, Barr's reimagining of the character saw her values more closely aligned with her real-life views - supporting Donald Trump and irrationally fearing her Muslim neighbors, for instance. The fact she ended up spewing hateful, racist garbage on Twitter should not have come as a surprise to anyone. Despite that, the statement also tried to bring up Roseanne's history of bringing together "characters of different political persuasions and ethnic backgrounds in one, unified family, a rarity in modern American entertainment." The statement concludes by calling for forgiveness for Barr, describing her character as "a strong, matriarchal woman in a leading role," and declaring that "Our society needs to heal on many levels. What better way for healing than a shared moment, once a week, where we could have all enjoyed a compelling storyline featuring a witty character - a woman - who America connected with, not in spite of her flaws, but because of them."